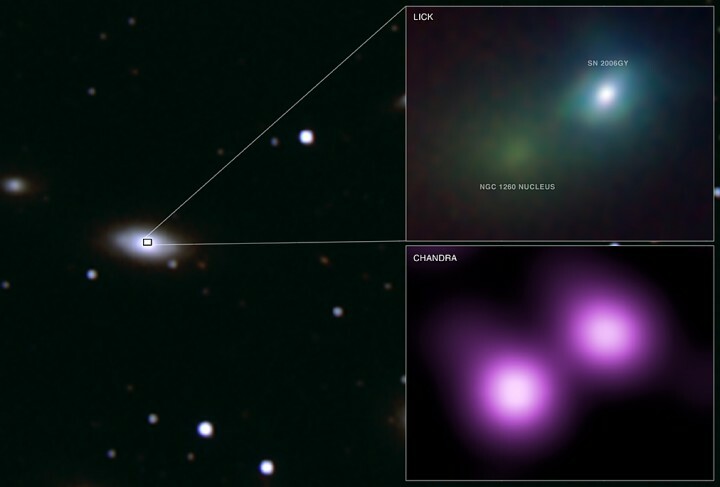 Explanation: The stellar explosion cataloged as supernova SN 2006gy shines in this wide-field image (left) of its host galaxy, NGC 1260, and expanded view (upper right panel) of the region surrounding the galaxy's core. In fact, given its estimated distance of 240 million light-years, SN 2006gy was brighter than, and has stayed brighter longer than, any previously seen supernova. 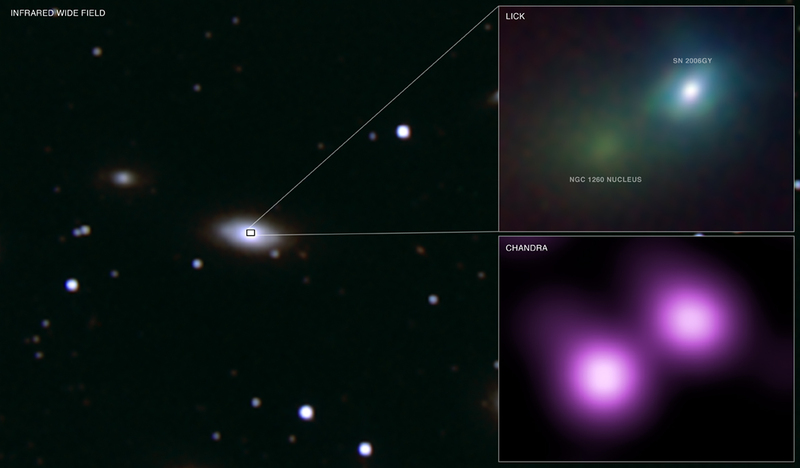 The Chandra observations in the lower right panel establish the supernova's x-ray brightness and lend strong evidence to the theory that SN 2006gy was the death explosion of a star well over 100 times as massive as the Sun. In such an exceptionally massive star, astronomers suspect an instability producing matter-antimatter pairs led to the cosmic blast and obliterated the stellar core. Thus, unlike in other massive star supernovae, neither neutron star, or even black hole, would remain. Intriguingly, analogs in our own galaxy for SN 2006gy's progenitor may include the well-known, extremely massive star Eta Carinae.